Guess where we got this photo? 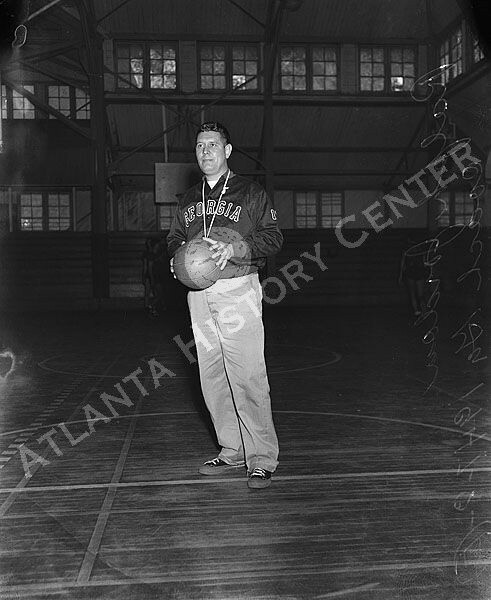 Not only is Jordan Auburn’s fifth winningest basketball coach, with a record of 95-75, he also coached Georgia’ basketball team from 1946-1950, compiling a record of 41-28, giving him a total of 136 wins in his coaching career. 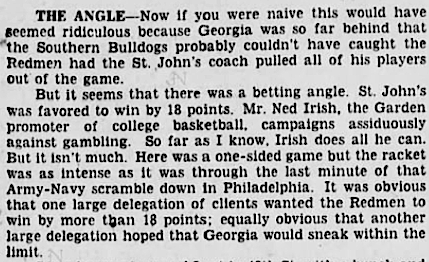 Shug’s first game as the Bulldogs coach came midway through the season in a tournament in New York City at Madison Square Garden in December of 1946. He and his players were in for an education. First of all, before the game, the young coach had to handle some trouble. Gadsden Times, Dec. 17, 1975. As the game wore on, when the lead swelled to over 25 points, the St. John’s coach would pull his starters, but every time the gap narrowed to twenty or less, the St. John’s starters came back in. Shug was puzzled. And why was the crowd inside the packed Garden so intensely interested in every basket scored in a blowout game with no conference significance? A Brooklyn reporter later explained what was going on. 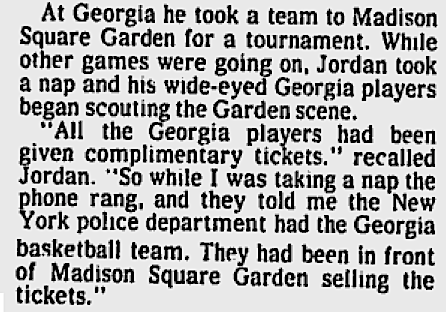 So to sum up: Shug’s first game as a head basketball coach was at Madison Square Garden with a team that lost 66-43 to St. John’s after almost getting arrested for scalping tickets. His shortened first season resulted in a 2-3 record, his only losing season at Georgia. Michael Strickland (AU ’97 & ’98) lives in Murfreesboro, TN with his wife, Mary (AU ’98) and three kids, also known as “The Strickland Bunch.” He has a PhD in Theology from the University of Birmingham, England, and is Assistant Professor of Theology at Amridge University. Michael is from Moulton, AL, where big city betting ways are still eschewed. He has one of those freebie websites: professorstrickland.com. He randomly tweets at @stricm3. Related: That time Auburn students raided a train in their underwear: A briefs history.